In an Olympic year the D5 puts in an Olympic performance. It's going for gold and it's deservedly worthy of such an accolade. Although it's such a tight photo-finish with the Canon 1D X II that it's too close to call. It's no mistake that both Nikon D5 and Canon EOS 1D X Mark II have arrived in 2016. It's an Olympic year after all, with pro sports photographers seeking next-level kit to take next-level images in Rio. Not that's the only place such cameras are capable of scoring gold, of course, with adept versatility for studio and field work alike. And we've had the fortune to use both big daddy DSLRs ahead of their respective releases. While our set of shooting experiences with the Canon was more tailored - a stunt school in Denmark was the backdrop to some great testing situations, as detailed in our review - our out-in-the-world experience with the D5 during a break in New York has proven just how capable it is too. To recap: the D5 touts the most focus points on pretty much any camera with its new 153-point setup (ignoring Sony's 425-point system in the A6300), super-fast 12fps continuous shooting, and absurdly high ISO 102,400 maximum (extendable to Hi5, ISO 3,276,800 equivalent). By compare the 1D X II goes one faster to 14fps, ISO 51,200 standard maximum, but shies away on the number of focus points with a re-worked 61-point setup. It's not just a numbers game, though, it's all about true, real-world performance. 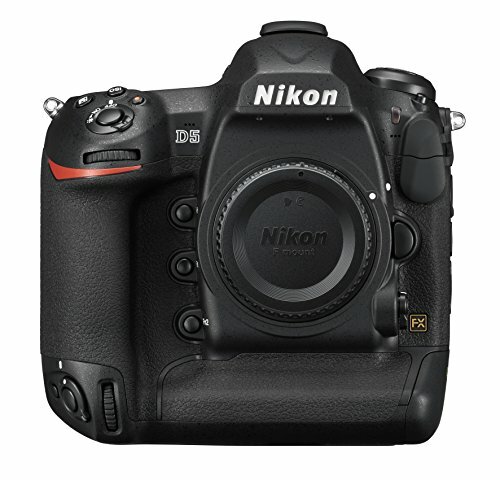 And on that front, Nikon has created a gold winner in the D5. Can it do no wrong? Here's what we make of it. We used a Nikon D4 for around a year after its release in 2012, so became very familiar with that camera and what it could do. The D5, by comparison, is a similar experience - but it's amped things up in a variety of departments. Not just in terms of sensor, speed and autofocus, but design too. The D5's new body doesn't look especially "new" at first glance, it's more about subtle tweaks for the better. Dual joysticks - which are arranged for both portrait and landscape orientation - adopt a more textured finish than before, which is great for wet or gloved fingers when making focus point adjustments while looking through the finder. Additionally the ISO button has been moved from the rear of the camera to the top, just behind the shutter, which is more Canon-like in style but helps to make room for the burst mode adjustment button to the rear. This latter new button can be used to adjust the speed of continuous high (CH) and continuous low (CL) options (when selected on the physical drive mode dial, otherwise the button does nothing) should you want to shift from their respective 5fps and 12fps defaults. Perhaps a CL at 7fps and a CH at 14fps (with mirror up only (M-up)) suits you better instead? There are additional customisable function buttons this time around too: an Fn3 appears to the rear left side (the info button which used to be here moves over the camera body); and an Fn2 button around the front joining the Fn1 and Pv buttons for those reaching fingers. Fn3 quick-dives into the menu for either network settings, rating or voice memo - but that's all - which is similar to Fn1's network or playback settings. We'd actually like to see a little more customisation here, to let users decide what to setup where. It's Fn2 that is most customisable, with AF area controls and more. A more hidden point, but a key one, is that the D5 comes in two forms: one sports two CompactFlash card slots, the other two XQD card slots. There's no in-between 50-50 option, so you'll have to make the right decision for you at purchase. We're reviewing the XQD setup, which ought to benefit from being marginally faster than CF maximum (note, Canon's use of the entirely different CFast format in the 1D X II is quicker again), but, for us, was a total pain due to lack of two cards. Still, D4 users who invested in XQD may see this as the route forward. There's no doubting the D5 is a big and weighty beast. "Oh that's a big camera", was a common remark - but then it's not that you'll ever see many out on the streets. It is a big camera, but handled with two hands almost everything fits into place for quick settings adjustments in either portrait or landscape orientation. However, the press-and-hold for the ISO adjustment is a little trickier to function given its position up top. Sure, the AF-S/C adjustment press-and-hold has always been like this, but that feels more natural because it's easier to use left and right hands simultaneously to do so. Anyway, it's these autofocus options that really excite in the D5. There's always going to be a war on with Canon to see which maker can produce the best setup. And while numbers don't necessary mean "better" focus capability in all situations, the 3D tracking option with its 153-points in the D5 is really astounding. Its available in normal or wide arrays within deeper settings, to suit different shooting situations. More focus points means more nuance and more data to feed the system, so it can predict and follow movement more adeptly. And once it locks onto a subject it really does feel like there's no letting go: bikers going down the street would be snapped up almost instantly without pre-focus and remain in focus whether moving through the frame, towards or away from the camera. Although we suspect not many will use the fullest array for most conditions - plenty of pros are happy with a 5-point group cluster in all honesty - but the option for 25-point, 72-point or the full array (plus 3D tracking) will cater for different scenarios. Of those, however, only 55- or 15-points are available to select, otherwise you'd be thumbing around forever trying to move the point to the desired position. The in-between points are just that, in-betweeners to feed that extra data. And we particularly like how the 153-point lights-up the outer edge of the focus area, showing how widely the array covers the viewfinder; 72-point and 25-point arrangements are centralised square setups. Switch to AF-S and 5-point, group and auto are the options. Sensitivity in portrait orientation is top-notch thanks to 99 cross-type sensors, 15 of which support sensitivity to f/8 for heightened response when using a teleconverter - ideal if you're shooting with a tele-converter and can't have super-fast apertures available. Although we've not actually been able to test such responsiveness given lens selection for this review (it's been 24-70mm f/2.8 all the way). Whether using single or continuous AF we've been mighty impressed with the accuracy and speed. The D5 does a mighty good job in low-light conditions too, without unnecessary focus hunting. We've snapped a variety of candid shots in New York in dim bars or on the streets and, frankly, it's like the camera can see things that we can't. It's that good. It's 100 per cent more sensitive than the D4 thanks to -4EV capability, which is like focusing in moonlight. Capable focusing isn't just restricted to slow speeds, though, with the D5's continuous burst capable of 12fps (14fps with mirror lock-up / live view). Which isn't the 14fps (16fps mirror lock-up) of the Canon EOS 1D X II - and that, given burst shooting is one of the major purposes of these cameras, does see the Nikon lag behind a touch. Blink and you'll miss it, of course, but the same could be said about getting the best shot from a burst. At the 12fps rate we've been able to snap 78 raw & JPEG Fine shots consecutively before the rate slows; all that data is written to card (here XQD) in around 8-seconds. No waiting around here then, that's a substantial stack of images. However, to put it into context, we could shoot an additional 92 frames with the Canon 1D X II at the yet-faster 14fps rate before it hit the buffer wall. Nikon claims 200 consecutive raw (only) files can be snapped, but that's not the result we were pulling from a 400MB/s card. So, again, the Nikon is lags behind the Canon in this regard. Realistically we don't think many pros will end up exhausting the D5's buffer, even if the Canon can do more. How often do you hold down the shutter for a full 6-seconds and cross your, arm, toes? You'll be able to shoot many, many continuous sequences too, given the longevity of the D5's battery. It's one of those cameras we can take away for a weekend city break without the charger and not need to worry. And for studio/location work the dual battery charger will have you covered should you need a spare. There's been a lot of chat about something crazy like 6,000+ images per charge. That's nowhere near what we were achieving: think 1,250 shots per change, including a bunch of live view, playback, menu tweaking and so forth. If all you're doing is shooting bursts without periods between use you might see more shots per charge, of course. One area where the Nikon really does want to make it a numbers game is with its maximum high ISO potential. As standard you can shoot ISO 100 - 102,400. Which a few years ago you'd laugh off as obscene and unusable but, actually, we've shot dark subjects and even blacks hold out well without too much image noise. There's not heaps of room for manipulation at six-figure sensitivities of course, given how exposure tweaks in post will really rear the ugly head of image noise, but it's a mighty impressive feat. We've looked for any banding and other nasties in heavily manipulated images, but Nikon has learnt its lesson after the not-so-hot D7100 era. Which is one way of thinking about the Nikon D5: it's arguably the more capable low-light camera, with an additional stop of ISO sensitivity over the 1D X II. If you want full-frame to shoot, say, live gigs then this could well be the DSLR to go for. However, it does get out of control. Throwing in an ISO 3,276,800 might sounds like winning the lottery, but it's an utterly pointless setting. Whatever we've shot comes out in a mess of purple haze, with barely distinguishable subjects, rendering it a pointless setting for the sake of the seven-figure number. Stick to what works please Nikon, because the high ISO sensitivity of the D5 is exceptional, it's just allowed to be pushed too far in the "Hi" settings for headlines and gloating purposes. Anyway, that's high ISO, which is one thing, but then there's the matter of mid-low sensitivities which are perhaps the most important. If you need to up the shutter speed then bumping the ISO sensitivity is your friend. Unless, of course, it turns images into mush thanks to overzealous processing. Not so with the D5: shoot ISO 3200 and you'll still be printing full pages, no problems. Shoot ISO 800 and you'll be laughing at how good everything looks. But go lower still and the level of detail on offer is really quite something, assuming the right lens is on the front anyway. An ISO 100 snap of a Brooklyn street, complete with pro-Sanders wall painting, oozes colour and detail. The D5 has pretty much got it all. Except for one point: auto white balance in mixed lighting environments often goes the wrong way. We know we should pre-set white balance, but testing the new camera at an Acer launch event we didn't. The results were fine, but mixed ambient and natural lighting led to some off-colour results; the same can be said for an NYPD officer riding a horse, which has been thrown off course due to the pink billboard lights in the background. Still, with subject recognition the camera should know the balance differently. Other than that small point we're struggling to find a bad thing to say about the D5's image quality. Full-frame means full depth of field. An upgrade to 21-megapixels (well, we're counting 20.7 if rounding up from the 5568 x 3712 files) means more scale compared to the 16MP D4, which in 2016 is great for either in-camera or post crop - and there's the detail available to make the most of it. A look at the D5's viewfinder and you might notice two clips to its sides. That's because it can be swapped out for different eyecups - which could be particularly useful for, say, a movie-focused setup. And with 4K prowess this time around, the D5 is fairly well setup for video. And we say "fairly" because it's not top of its class: select the 4K 30fps option and you'll see a 3-minute maximum countdown for capture, not the 30-minute maximum that comes with Full HD capture. We're presuming the reason for this is to avoid the sensor overheating, but there's no official stance on the matter. Rumour has it a firmware update may extend this capture time in the near future, but whether that's the case remains to be seen. You can, however, use the HDMI for a clean output via an external recorder, which is one-up on the Canon 1D X II. However, we don't have such a recorder to see whether the record time limitation causes an issue with capping capture time, which we presume it does. There are microphone and headphones 3.5mm jacks to the side too. In the live preview or video modes - selected using the toggle and activation button to the rear, we're not totally sold on its position and would rather it higher up the body - comes another major new feature for the D5: touchscreen. Yep, a pro-spec DSLR with a touchscreen. Tap on the screen in live view to select a focus point, or for smooth and easy refocusing during video capture. It's a great feature, albeit underused: we would like more menu settings to toggle on/off whether the screen worked for menu controls and other settings. The ability to swipe through images and pinch-to-zoom rather than faffing around with magnifying glass zoom buttons feels like a step into the 21st century though. What this screen does lack - and just as we said of the Canon EOS 1D X - is a vars-angle bracket. Now you might think we're mad to suggest such a thing, but the Pentax K1 full-frame DSLR has a sturdy offering that we would have loved in this Nikon. Using a bulky 1.4kgs camera (without a lens) means you sometimes have to contort your body to get angles that you want - a screen that could be manipulated would be a huge plus. Hats of to Pentax for that one, we think it's a trick the other big Japanese makers have missed out on. Joining the video-based ports is that other high-end port: Ethernet. With 1000 Base-T maximum speeds it's super fast for channeling data down the wire, if that's how you need to get your images to clients rapidly. If you want GPS or Wi-Fi, however, then neither are included within the camera - you'll need to buy additional accessories for such tasks, and can only connect one to the 10-pin terminal (which, primarily, is there to be used with remote controls). Not that we're surprised: the sturdy body can't be the best for Wi-Fi signals to push through. Make no bones about it: the Nikon D5 is an astounding pro-spec camera. It's also inevitably going to be compared to the Canon EOS 1D X II. Of the pair we'd say the Canon is the speedier and, arguably, more adept at video work; the Nikon, on the other hand, has a more detailed and nuanced focus system in our view, plus has the upper hand in low-light and high ISO performance. There's not a lot between them, but those are how we would separate them, whisker-width though that separation is. Not that you're likely to switch from Canon to Nikon or vice-versa if you're an established user. But if you're a D4 owner then, well, the D5 seems like a no-brainer to us - £5,200 in your back pocket pending, of course. An upgraded focus system that locks onto subjects like superglue; a bump in not only image quality, but resolution; plus additional quirks like the new layout, touchscreen options, 4K capture (despite its hindrances), and, not forgetting, a faster continuous shooting mode than before at 12fps. Of our few qualms it's the absence of a variable screen mount, occasional obscure auto white balance selection, and lesser burst and buffer than the Canon 1D X II that go against the Nikon D5. That and the inevitable size and weight that won't work for all situations.